Last year I took my first stab at gardening. Certain things were fairly successful—I grew a moderate amount of thyme, a few cherry tomatoes, and more basil than I knew what to do with. The rest of the things I grew pretty much failed, some for clearer reasons than others. Periods of neglect due to pre-wedding travel played a significant role in much of my garden’s demise, but, by the end of the season, I knew that there were other things I could have done differently along the way. Peat pots are bad news. I thought that the peat pots I bought last year to start my seeds in were the greatest things ever. They looked very organic and were supposed to be biodegradable and plantable and all that jazz. 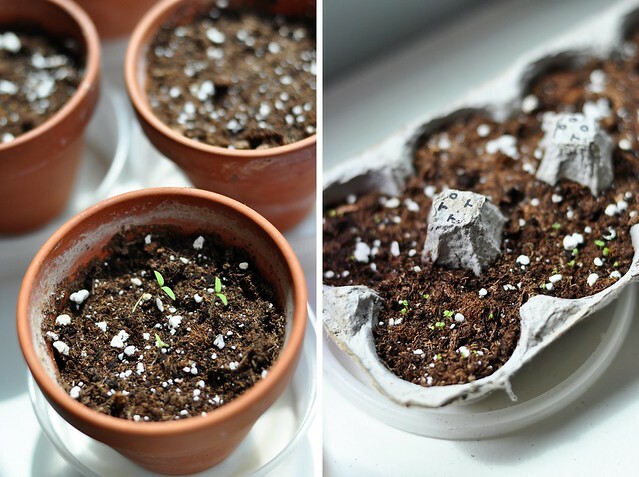 After watering my seedlings in them for several weeks, however, they grew sort of mildewy and I found myself peeling them off before transferring my plants. The biggest issue with them, though, was something I didn’t even realize until this year. I started my garden a little late in the season and honestly just didn’t feel like buying more peat pots. I had a handful of small terracotta pots that I’d saved from some succulents I purchased several months ago (and promptly killed—aren’t succulents supposed to be easy?? ), and decided to use them instead. My tomato seeds went in the terracotta pots and a few herbs were relegated to the wells of an egg carton. Everything else was started outside. 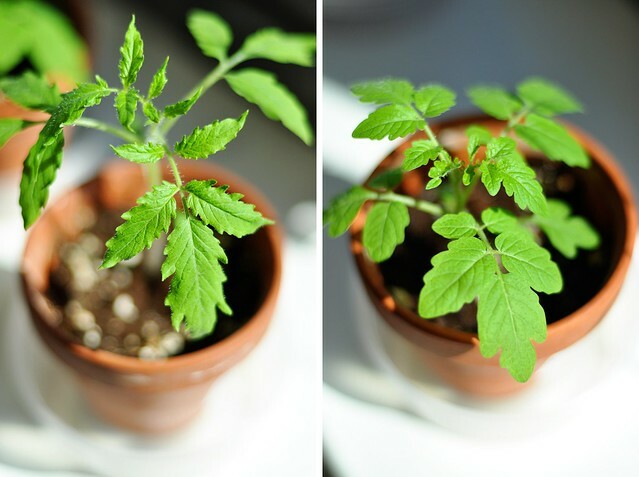 Last year, my tomato seedlings came up…and did nothing. Absolutely nothing. They remained as teeny, tiny, two-leafed plantlets for weeks upon weeks, until I finally put them into larger pots outside at the end of May. Even then, they were so stunted that it then took a good month before they began to grow again. It wasn’t until August that they started to look anything like the tomato plants I have right now. And I’m blaming the peat pots. 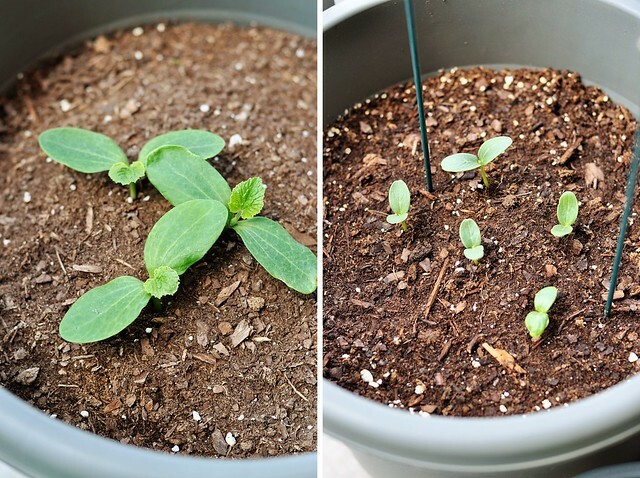 In the terracotta pots, the seedlings grew right up, sprouted true leaves, and continued their ascent. The ones that didn’t make it outside have still been hanging out on our windowsill (I’m having emotional issues letting go of them) and one has grown to more than three times the height of its pot. It’s tall and lanky and kind of ridiculous. Chris and I joke that I’m growing a beanstalk. 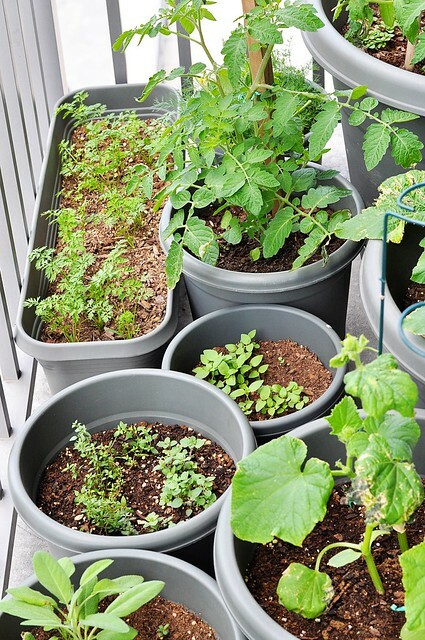 The way I picture it in my mind, the solidity of the terracotta pots gave the tomato plants support, something to ground themselves in, push off of even. And thanks to the fact that they were able to keep growing, I now have blossoms on both plants and a couple baby tomatoes on my cherry tomato plant—a full two months earlier than last year. And I got a late start. Grow Great Grub was my first-time gardener’s bible. While reading I took tons of notes about all the things I was going to grow and went back again and again to consult its pages for advice. There are just some things you have to learn for yourself, though. Like, just because two plants grow well alongside one another, doesn’t mean that you should grow them on top of one another. After reading GGG’s section on simpatico flora, I tried cramming at least two different things in nearly every container I planted last year, including the smallest ones. Inevitably, there was a battle and something was displaced. I had to remember: it’s a container, not the ground. There is a finite space for roots to spread. Pots of mixed lettuces or herbs are one thing–trying to plant radishes in my zucchini was another. The only case where doubling up actually worked was in the big pot that I grow my tomato plant in, where there’s plenty of room for some basil as well. Sage, rosemary, and kale all have one thing in common. Start cukes outside…and maybe zucchini too. Last year I started both my cucumbers and zucchini inside. They popped out of the soil quickly, looking healthy and excited to get the show on the road. Once they were relocated outside, however, they changed their tune. The cucumbers in particular. I had to start my cukes three times last year. That’s right, three. The first time, the shock of the transplant killed them off. Then I tried starting them outside and a freak windstorm destroyed bunch number two. The third round finally stuck and I had several small cucumbers growing on the vines—but I went away, the plant dried out, and never fully recovered. The zucchini did pretty well last year, suffering mostly from human error, but were still awfully susceptible to the winds. Timing-wise, it didn’t even make sense for me to start them inside this year, so I direct sowed them along with the cucumbers in mid-April. It was still pretty cool outside, so it took them a couple weeks to sprout, but, when they did, it was obvious that they were all more deeply-rooted than any of last year’s. As they’ve continued to grow, I’ve seen thicker stems and stronger wind-resistance—they just look and feel like hardier plants. I did learn last week that they’re not immune, though. The leaves got roughed up pretty badly one day when the wind was particularly strong. So, I’ve done some careful rearranging of the garden, putting the plants that seem better able to stand up to the wind in front of the more easily battered ones as a buffer. The pots may not be arranged prettily by size anymore, but everyone seems a bit happier in their new positions. I’m hoping that strategic placement coupled with the added strength they seem to have will be a winning combo this time around. Note: This tip is likely not for everyone. I do think that cucumbers fare better if they’re not transplanted, but starting my zucchini outside may only be beneficial because my garden is located where it is. I imagine a ground level garden that isn’t regularly subject to violent gusts would be able to sustain more delicate plants. Prune your plants—but don’t mutilate them. The aforementioned “human error” inflicted upon my zucchini plants last year was this: I trimmed the life straight out of them. Every time one of the leaves began to look the slightest bit less than lush, I cut it off. And I didn’t just take the leaf off, I cut the whole stem down to the quick. I thought I was saving it from spending energy sustaining dying leaves and that it would instead put those energies into producing fruit. Eventually, my zucchini plants began to look like knotty vines with a few sad leaves attached at the top. They stopped growing and started becoming unhealthy, the leaves yellow and dry. This year, I’m letting them look rough, only trimming the leaves that are already shriveling off the plant and leaving the stem. It is unnecessary to be precious with basil. Save for being impatient for an earlier harvest, I can’t say that I understand starting basil indoors and then potting a handful of individual plants. 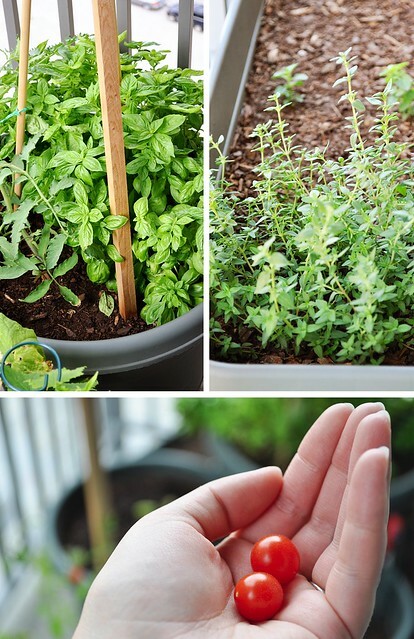 From my experience last year, basil—sown directly and indiscriminately—grows like a weed. Once it gets going, there’s no stopping it. Good luck finding enough ways to use it all. Too much basil. Isn’t that what we all really want for summer? Now, all that having been said, I’m sure there are many many people, more horticulturally savvy than I, that would disagree with my “tips”. Really, these are just things that I’ve learned work for me–and goodness knows I’ve still got a lot more to learn! So there’s my disclaimer. But maybe you have a similar setup or have encountered similar issues, and maybe these things will help you. Or maybe you’re just as fascinated as I am by the fact that you can put a seed in some dirt, pour water over it, and make a plant. Either way, these are some of the ways I’m making mine. Some good tips! Thanks for letting me know about planting basil w/ tomatoes. I have run out of room for it, and wanted to plant some. Hope your garden is much more fruitful this year! I do have a hint for you. 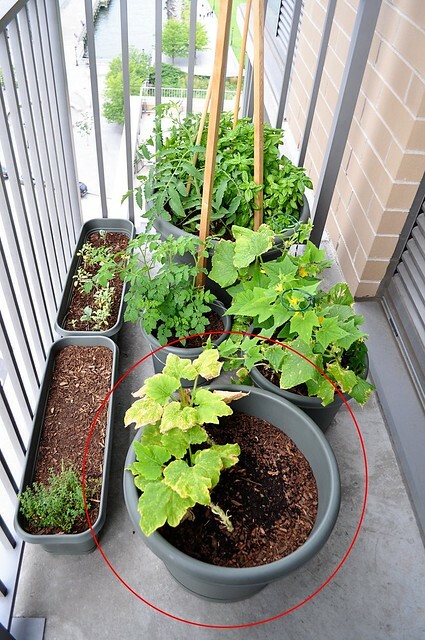 Whether you are planting in a pot outdoors or the ground, put a circle of black stiff plastic around the inside of the pot, like a collar. That will heat up the soil and act as a buffer against the wind until the plants get to be a good size. We do that in our garden in the yard and it really gives the plants a boost. Barb, that sounds like a great idea! I’ve more than once considered lining the whole balcony with plastic or plexiglass to keep the wind out, but realized that may be a bit excessive…. Individual collars for each pot is so clever, though! I honestly have better luck with containers then my current garden (less weeding). I have had success with eggplant, cucumbers, tomatoes and my favorite carrots. If you get Danver half long carrots and a window box you will have carrots. I also had success in using old brownie pans with holes to grow radishes and scallion (small scallions but it was still cool). Another thing I read if you get “food grade” plastic buckets drill holes in them and use the lid as a water catcher. You will have a nice 5 gallon bucket to grow potatoes. 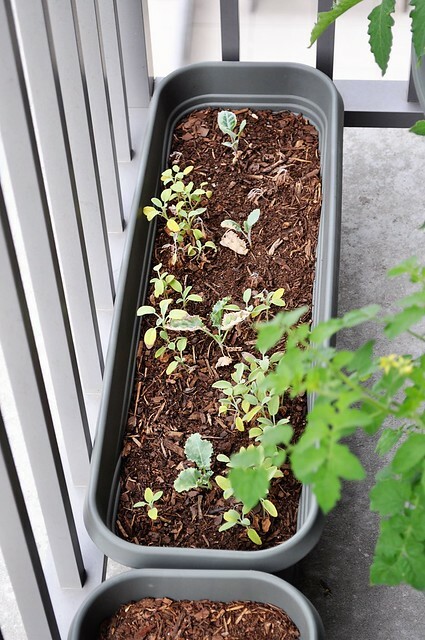 They work great for strawberries (side not on strawberries they will send runners out to other pots and spread – I currently have 4 different strawberry plants). Great blog on veggies. Will keep up with you over the summer growing season.